A bond’s yield or return is one of the key things that investors assess when evaluating the quality of a bond investment. However, there are many ways in which bond yields are expressed, making it difficult for an investor to understand and compare the target returns on different types of bonds. The nominal yield is the return of a bond as determined by the percentage of the face value the bond’s annual coupon payments amount to. It is effectively the bond’s coupon rate. 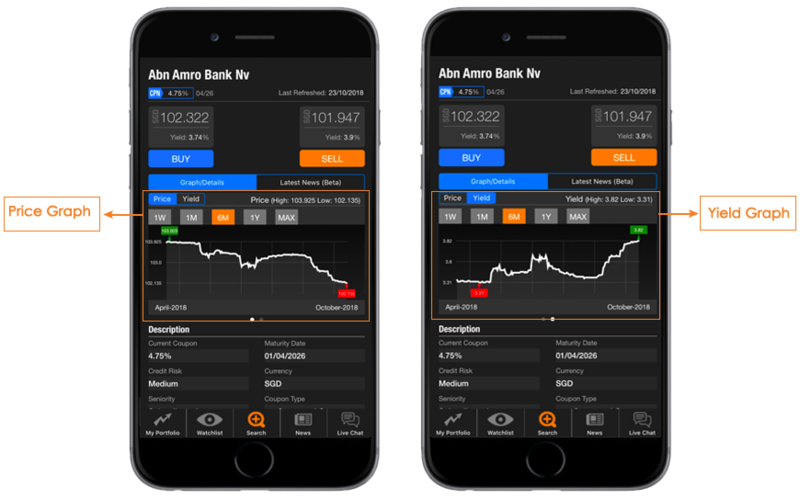 Let’s look at an example of a fixed rate callable bond – ABN AMRO Bank. The cash yield is a measurement of a bond’s return or yield on an annual basis as represented by a percentage of the bond’s current market value or price. Since bonds are traded in the secondary market, they may trade above or below par value, causing an investor’s return to be different from the coupon. Thus, this yield tells investors what they can expect in terms of return in the current market. The yield to maturity of a bond describes the average yield or return that an investor can expect from the bond each year if the bond is purchased at current market price and is held until maturity. 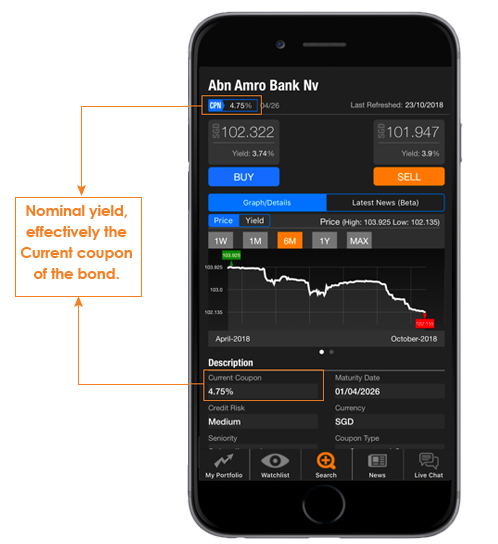 This yield is determined using the coupon payments, the value of the bond at maturity, and any capital gains and losses that are expected to be incurred during the lifetime of the bond. 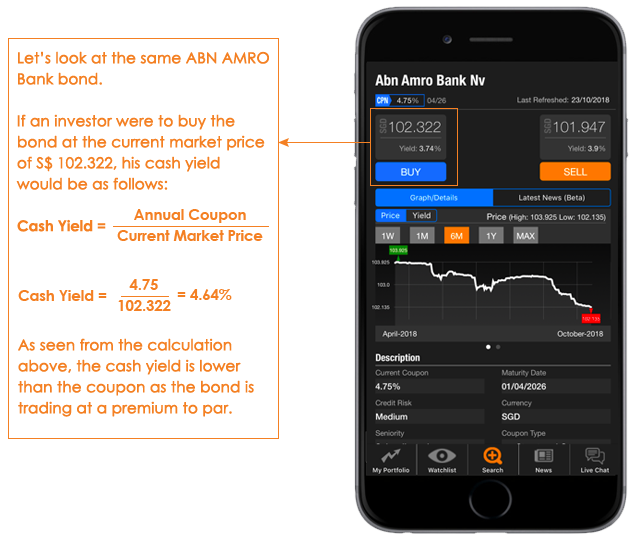 Yield to maturity calculations typically assume that all coupon payments are reinvested, rather than distributed, during the lifetime of the bond, and is the most typical measure used by an investor to compare the return of different bonds. The calculation is illustrated below using an example of a 2-year bond that pays annual coupons. YTM represents the yield to maturity. Looking at the above formula, it is clear why the price and yield of a bond move in opposite directions, thereby exhibiting an inverse relationship as seen in the price and yield graphs below. 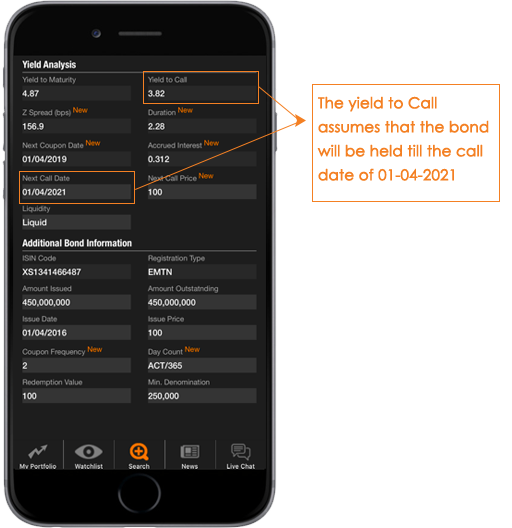 Yield to call is an effective measure of yield for callable bonds. Callable bonds entitle the bond issuer with the option to redeem the bonds at a pre-defined call date that is before the maturity date. The yield to call of a bond refers to its yield at the time of its call date and does not apply if the bonds are not called back but are kept outstanding until they mature. This value is determined by the bond’s coupon rate, its market price and the length of the call date. Below is the yield to call calculation for a 5-year bond with a call date 2-years from now (5NC2). Let’s revisit the ABN AMRO Bank bond to illustrate the YTC calculations. The yield to worst describes the worst possible yield on a bond without the issuer of the bond going into default. Bond features such as call options, prepayment or sinking funds, all of which could negatively impact the bond’s yield, are considered when calculating yield to worst. Yield to worst numbers are determined for all possible call and put dates for a callable or puttable bond, to provide as much information as possible to investors. Which Yield Should You Choose? The choice of yield depends on what type of bond is being considered – whether callable or non-callable. The yield to maturity is the most useful measure for a non-callable bond that is intended to be held to maturity. The yield to maturity and yield to worst are the same for such bonds. Yield to call or yield to worst are the yield measurements to consider for callable bonds. For a callable bond bought at a premium to its par value, looking at only the yield to maturity will overestimate the ultimate return on the bond if it is called. In this case, the yield to worst can help determine what the lowest potential return could be. 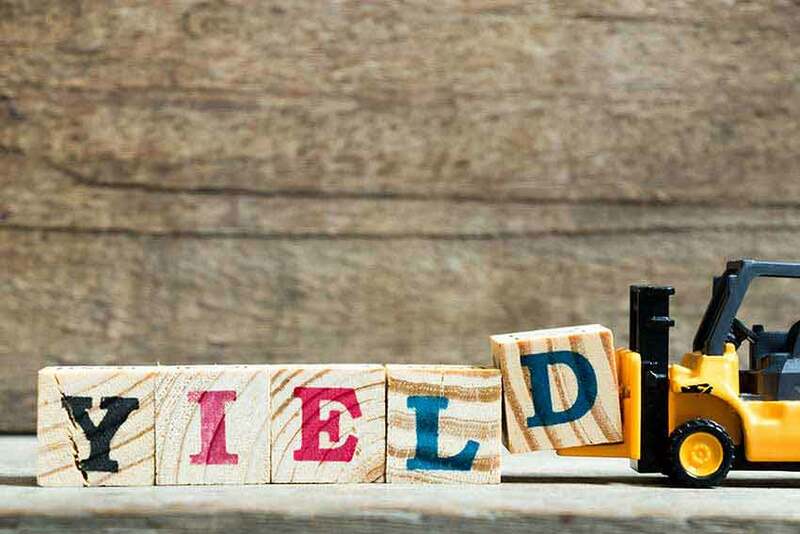 When determining an approximate target yield for fixed-income investments, understanding the various types of yield measurements and which ones to use for a specific bond will help simplify the investment process and decision. 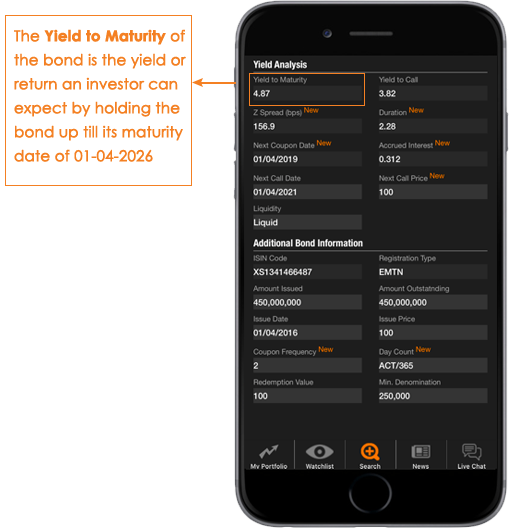 Track the different yields on your bond investments on the BondEvalue App!